Steller sea lions are managed by the National Marine Fisheries Service (NMFS), a branch of the National Oceanic and Atmospheric Administration. The species falls under the jurisdiction of the Marine Mammal Protection Act and is protected under the Endangered Species Act. Comanagement agreements have been established between the NMFS and the Aleut Marine Mammal Commission, the Traditional Council of St George Island and the Traditional Council of St Paul Island. Additionally, NMFS has enacted regulations to reduce threats to Steller sea lions including prohibitions on shooting at or near sea lions by anyone other than Alaska Native subsistence hunters, no-entry zones for vessels around rookeries, limits on incidental take of sea lions in commercial fisheries and research, and fishery closures in the waters surrounding some rookeries. 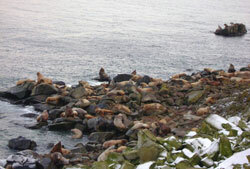 Complete information about Steller sea lion management may be found at the NMFS Alaska Regional Office.